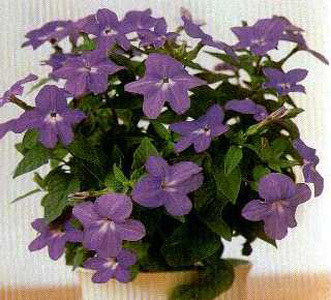 Home|Floral Library|Browallia – Browallia spp. Decorative Life: A few weeks to months depending on culture and use. Named after J. Browall (1705-55), Bishop of Abo, Sweden, a defender of the then unpopular Linnaeus’s sexual classification system for plants. Good growth habit for hanging baskets.